Courtesy of United Methodist Publishing House. Less can be more, small can be beautiful and small group ministry can lead to church growth and more meaningful Christian lives. That last idea, especially, is embraced by Korean American United Methodists. The proof is in a new English-language translation of a small group ministry leader training guide. 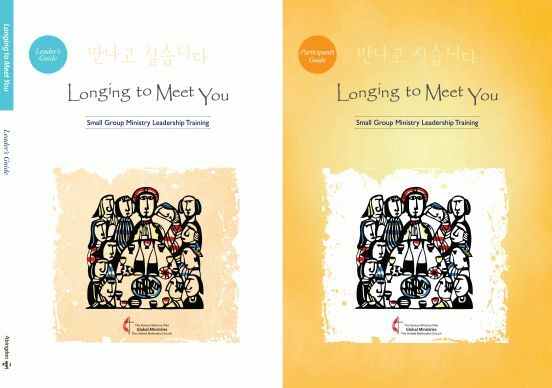 “Longing to Meet You,” originally published in Korean four years ago, combines practical advice with Wesleyan theology. The Rev. Paul Hak-Soon Chang, executive director of the Korean Ministry Plan, hopes the book will eventually be translated into other languages and reach far beyond the denomination. For now, though, the aim is more specific and modest. “Our first target is the English-speaking Korean Americans, the `next generation’ Korean Americans,” Chang said, stressing that it would be valuable for any English-speaking congregation. Korea is a country of mega-churches, with some far larger than the biggest in the United States. But among the throngs coming for worship are many who meet elsewhere in groups of seven to 12 for Bible study and mutual accountability and support. Such groups constitute important building blocks for those churches by strengthening individual Christian lives, said the Rev. Keihwan Kevin Ryoo, associate pastor of First United Methodist Church of Rapid City, S.D., and pastor of Rapid City Korean Church. Materials abound for training small-group ministry leaders, but Korean American United Methodists noticed a dearth of materials grounded in the theology of John Wesley, founder of Methodism. The Korean-language original version of “Longing to Meet You” fills that gap with its emphasis on grace, including prevenient, justifying and sanctifying grace. It also offers stresses the importance of prayer, Bible reading and working through a series of questions aimed at providing an honest, supportive environment for Christian growth. About 3,000 copies of two editions of the Korean-language version have been distributed, with roughly 300 clergy and 1,500 laypersons going through training sessions tailored to the book, Chang said. The book already has begun to be used in the Korean Methodist Church, a separate denomination in Korea, he added. Ryoo served as editor for the English-language edition, published by the United Methodist Publishing House's Abingdon Press and available in leaders’ and participants’ editions. Prumeh Kim — daughter of the Rev. Keyong Hee Lee of the Northern Illinois Annual (regional) Conference — handled the translation. She had translated articles and sermons but never a full-length book. The experience, given the subject, was a labor of love. On the cover for “Longing to Meet You” is the late Japanese Christian artist Sadao Watanabe’s depiction of the Last Supper. The image is fitting, Chang said, since it shows Jesus in small group ministry with the disciples. John Wesley did not make the cover, but his example, as well as his theology, informs the book. Ryoo notes that Wesley insisted that followers of Methodism spend time in weekly class meetings, believing them crucial to Christian formation.